The MuseumsQuartier ("Museum′s Quarter") is Vienna′s most recent addition to internationally renowned sightseeing attractions. Spread over an impressive 60,000 square metres of exhibition space, the MuseumsQuartier unites an array of outstanding contemporary art as well as classic modern pieces including the World′s most extensive collection of Schiele works in the Leopold Museum. It is situated in the former Messepalast or convention centre, which had previously served the Empire for the Imperial Stables - thus the splendid Baroque scenery with horse ornaments on the mantelpieces of most gates. The contemporary architecture that allows to adopt the historical buildings to their new purpose was designed by Laurids and Manfred Ortner. 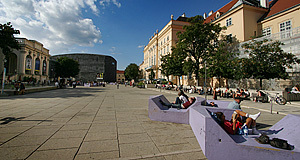 The construction works started in April 1998 and only three years later, the MuseumsQuartier was opened. The refurbishment cost a stunning two billion Euros. Bloody hell - I just realised where my pension went. Anyway, the investment gave rise to one of Europe′s most exciting and extensive exhibition sites of modern art. As stated above, the original purpose of the buildings was to serve as the national stables for the Holy Roman Empire of German Nation. In 1713, Emperor Karl VI hired Vienna′s most distinguished architect Johann Bernhard Fischer von Erlach to design the stables. The completion, however, was done by his son Emanuel Fischer von Erlach in 1725, as his father had passed away in the meantime. Significant extensions and refurbishments were done in the 1850ies under the reign of Emperor Franz Joseph I. After the end of the Empire in 1919, the majority of the buildings was sold and as the purpose of the stables was pressing anymore - cavalry had proved to be outdated in WWI. In 1921, the buildings were used as convention and fair halls for the first time. In the following years and decades, they were refurbished and remodelled repeatedly - this was done until up to the 1960ies. The former stables became known to the Viennese as the "Messepalast" ("Fair Palace"). In 1985, the property served as a venue to the Wiener Festwochen music festival for the first time and became on of the premier venues afterwards. Between 1980 and 1986, there was a wide and vicious debate about what the former Imperial stables should be used for. First proposals about the final use of the venue suggested a site of several museums dedicated to modern art. Such proposals were initially met by opposition as well as additions to supplement the modern art museum with institutions for modern media such as film and video, computer art and a multi-media library. In total, some 88 projects were suggested in a competition to solve the question of how to solve architectural issues. Discussions rose again when media reported the exploding costs of the project - nonetheless, the MuseumsQuartier opened in 2001 as the eight-biggest museum space in the World and in direct neighbourhood to the Kunsthistorisches and Naturhistorisches Museum. There are three major museums that are part of the MuseumsQuartier: The MUMOK or Museum der Modernen Kunst Stiftung Ludwig (Museum of Modern Art); the Leopold Museum for Classic Modern Art including a nothing but mind-blowing collection of Schiele, Klimt, Kokoschka, Egger-Lienz, Ferstl, Moser and other mostly Austrian artists; and the Kunsthalle for changing exhibitions. Beyond that, there are more than a dozen smaller projects and institutions that found a permanent home in the "MQ" as it is called. There are be separate articles dealing with the Zoom Kinder Museum and the Tobacco Museum. Nearby attractions include the previously mentioned Kunsthistorisches Museum and the Naturhistorisches Museum. There is also the Volkstheater, one of Vienna′s many theatres. And of course the Hofburg alongside with the many attractions of the Ringstraße.